Club Opušten Bar is located in downtown of Belgrade, in No 26-28 Ilije Garašanina Street, at external side of Tašmajdan pool. The entrance is from parking space of Tašmajdan pool, from Ilije Garašanina Street. After short summer brake, club Opušten Bar is opening 5th season in a road for all party lovers. Club Opušten Bar is designed so guests can feel maximum comfort. Opening the 5th season, interior is this club is redecorated with a lot of effort. Also, club Opušten Bar has organised amazing music program, so you can expect a high class fun. New season in this club, bring you changes, innovations, but still low prices, perfect cocktails, and promotions for guests. A lot of surprises, new drinks, great music and an amazing atmosphere in 5th season of club Opušten Bar. Management of club has enriched music program, so any guest can enjoy. In club Opušten Bar, you can listen to domestic pop and rock sound, soul and Latino rhythms. Resident bands here are Double Trouble, Girls, Boys and Toys and Eclipse. Completely different than others club Opušten Bar, in a short time, has gained sympathy from many guests. 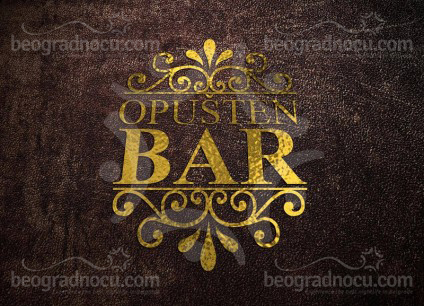 Only in club Opušten Bar, you can get free drinks and of course great and relaxed atmosphere. The atmosphere of this club follows the rhythm of a city - the combination of unique interior and creative content. Best party in town, new drinks, delicious cocktails and live band performances, will make club Opušten Bar your favorite place. Find out why many say that they had a best time ever in this club.